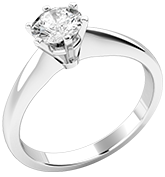 Here at Purely Diamonds we use the highest quality precious metals for our diamond jewellery. Choosing which metal to have your diamond jewellery cast in can be a tough choice. We’ve prepared a breakdown of the metals we offer below to help you select which metal is most suitable. All our platinum is '950' Platinum, i.e 95% pure. It is made by mixing 95% platinum with 5% other alloy metals such as cobalt and ruthenium. Platinum is the finest precious metal used in jewellery making. There is very little platinum on this earth and it’s found in very few places around the world. The rarity of platinum means that its price is invariably higher than gold or palladium. Platinum naturally has a brilliant white sheen and does not need to be rhodium plated like white gold to achieve its colour. The purity level in platinum is much higher than gold (95% compared with 75%), making it hypoallergenic and kind to sensitive skin. 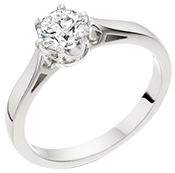 Platinum is very hardwearing and very dense, making it heavier than gold and more durable than other jewellery metals. It does scratch like all other precious metals, but a scratch is merely a displacement of metal and none of its volume is lost. Over time, platinum does develop a natural patina which many people find just as attractive as a polished finish. However, a professional polish will restore the jewellery to its original highly polished condition if you prefer. We recommend platinum over palladium if you have a reasonable budget to work with as platinum feels more substantial and because platinum is the most desirable of all metals used in jewellery making. Palladium is essentially a 'cheap' alternative to platinum. All our palladium is '950' Palladium, i.e 95% pure. It is made by mixing 95% palladium with 5% other alloy metals such as silver and gallium. The palladium hallmark was introduced on 22nd July 2009, and is now a legally recognised hallmark. Palladium is a noble metal and within the platinum group of metals. Palladium is internationally recognised as being a precious metal. Palladium is naturally white, like platinum, and therefore does not need to be rhodium plated to give it a white appearance and it does not tarnish. 18 carat white gold is 75% pure gold with 25% alloy metals including silver and palladium. White gold is not a naturally occurring metal. 18 carat white gold is 75% pure gold mixed with 25% alloy metals including silver and palladium. The gold mixed with the alloys creates a metal that is light grey / yellowish in colour. This 'white' gold metal is then plated in a metal called rhodium to make it appear whiter. Rhodium is very similar to platinum and shares many of the same properties, including its colour. It’s a very white metal but it will wear away so you will need to have your white gold jewellery re-plated every so often. How often depends on the wear and tear of your ring so it's impossible to say, but we recommend once per year on average. We offer a replating and repolishing service for £35 per ring. As such, it might be worth considering platinum as an alternative to white gold, as platinum does not need to be re-plated, therefore platinum may actually be more cost-effective than having your white gold jewellery plated every year for £35. 18 carat yellow gold is 75% pure gold with 25% alloy metals including copper and zinc. Unlike white gold, which needs to be rhodium plated to appear white, yellow gold does not require plating as it is naturally yellow. Yellow gold is hard wearing and will maintain its yellow colour, but it always looks best once it has been polished. 18 carat rose gold is typically about 4% silver with 75% gold and 21% copper to produce a rose/pinky color. Rose gold has a lovely feminine pink hue that stands out to individuals looking for something a bit different than the traditional white or yellow metals. This uses our 18ct yellow gold and our 18ct white gold to create a unique two-tone look. Generally, most of our yellow gold rings are made using a combination of yellow and white gold, rather than solely yellow gold. The reason for this is diamonds tend to look better set in to white metal, rather than yellow. So this way you can still have a ring with some yellow metal, whilst making sure the diamonds are displayed as best as possible. Some of our wedding bands are made with mixed metal options such as rose and white gold, yellow and white gold or a mixture of all 3 in some cases. 9 carat white gold is 37.5% pure gold mixed with alloy metals including silver and palladium. This metal is a good option when you want white gold but you don’t have the budget for the 18ct option. White gold is not a naturally occurring metal. 9 carat white gold is 37.5% pure gold mixed with alloy metals including silver and palladium. The gold mixed with the alloys creates a metal that is light grey / yellowish in colour. This 'white' gold metal is then plated in a metal called rhodium to make it appear whiter. Rhodium is very similar to platinum and shares many of the same properties, including its colour. It’s a very white metal but it will wear away so you will need to have your white gold jewellery re-plated every so often. How often depends on the wear and tear of your ring so it's impossible to say, but we recommend once per year on average. We offer a replating and repolishing service for £35 per ring. 9 carat yellow gold is 37.5% pure gold mixed with alloy metals including copper and silver. This metal is a good option when you want white gold but you don’t have the budget for the 18ct option. Unlike white gold, which needs to be rhodium plated to appear white, yellow gold does not require plating as it is naturally yellow. Yellow gold is hard wearing and will maintain its yellow colour, but it always looks best once it has been polished. 9ct yellow gold rings will be a lighter yellow colour than 18ct yellow gold rings, due to the lower % of pure gold in the metal. Our 9ct rose gold metal uses 37.5% gold mixed with copper and silver alloys.